Getting every gram you can out of a yield is awesome! Well, without the best LED grow lights for weed, you’re going to be leaving bud on the table—and that’s a fact. Settle in, grab a cup of coffee and a bowl, because this is an all encompassing guide with everything you'll need to learn before buying LEDs. Plus, the basics of growing cannabis with LEDs. *Keep reading for a complete buying guide or jump straight to the top LED grow lights reviews! Should You Choose a Full-spectrum LED? What Light Spectrum Does Cannabis Require? How do Plants Absorb Light? How Many Watts Do You Need for the Best Yield? Can LED Grow Lights Damage Your Eyes? 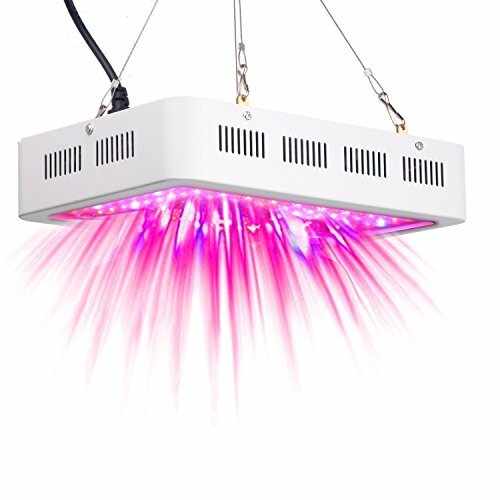 What are the Best Grow Light Brands? LEDs have recently taken the cannabis gardening community by storm. Quickly rising to the top because of they unique features the provide (more on this in just a bit). But what even is an LED? And what makes it different from traditional grow lights? LED stands for light emitting diodes. And they are typically encased in a casing with a heat sink and built in fans. Since they do not require a ballast, you can plug them directly into your home outlet. The diodes on an LED light run on average ⅓ to 1 watt of power. Meaning your lights offer a bunch of power at a third of the energy used. But some of the best LED grow lights have 1W, 3W and even 5W diodes now. When it comes to growing good bud, you need lights like our editor's choice, Viparspectras. One of the best LED grow lights on the market, it's available in both 600W and 1200W versions making it work for most anyone's situation. The 600W LED light pulls 276W and is the perfect amount of light for 3’x3’ grow tents—which you can fit about four good sized plants in yielding up to 1.5 grams per watt each! Basically, this light has your plants covered. It’s full-spectrum, hitting all of the wavelengths in PAR, and with its huge cooling fans you never have to worry about overheating. It features 130 5W Bridgelux/Epileds LED Chips that will last you over 100,000 hours—that’s a lot of harvests! Not only does this kit come with a chain to hang it up, but it also comes with bloom and veg switches. This means you can just run the blue lights during vegetation and red lights as soon as it’s starting to bud. These lights will help your plants develop strong stems, but also nice, thick buds. 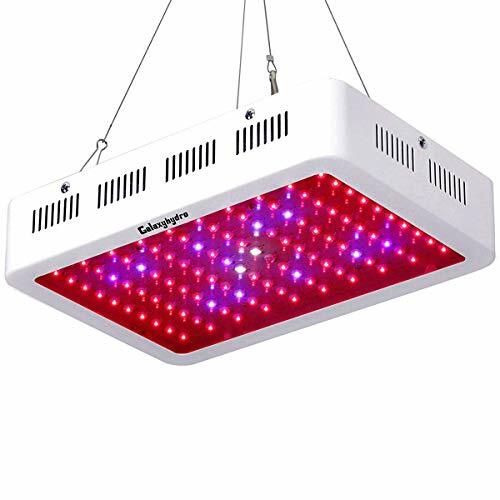 It’s tough to find any negative reviews of this durable LED grow light! Not all LED grow lights are designed with cannabis in mind. And while other LED grow lights will technically work for growing any plants, they might not produce the results you’ve been dreaming about. 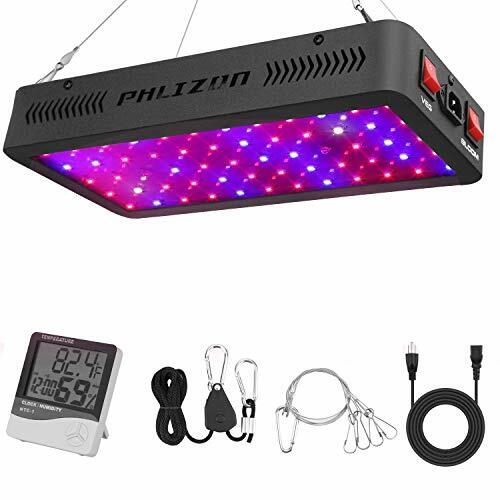 Enter the Philzon LED Plant Grow Light, a powerful system designed by cultivators who know precisely what your pot plant needs. Switch seamlessly between a spectrum designed for vegetative stage, to one designed for the bloom stage. The vegetative stage gives off perfect wavelengths of blue and white. Then, when the time is right, you can change over to the bloom setting, designed to boost flower development with red and white wavelengths. If you've been reading many reviews, then you know by now how important this is. If you are used to a more conventional non-LED system, you might wonder what this Philzon LED can replace? According to the manufacturer, their 600 w LED can easily out-power a 400w metal halide light. And it does so without the need for a reflector, and without pulling massive amounts of electricity. Overall, it’s going to be much cheaper to run, when compared to your old high pressure sodium dinosaur. This newest iteration of the Philzon line of LED grow lights is perfect for a 2’ by 2’ canopy space. Unlike high pressure sodium systems which need quite a bit of space between the plants and the light, to prevent burning, you can set these LED lights up 24” away. A space saver for those cultivators growing in super tiny indoor spaces. There is a powerful research and development team behind all of Philzon’s products. This is why growers trust the pre-made settings on the Philzon: the blue spectrum of the veg stage and the red spectrum from the bloom setting. The team behind this product has put the product through rounds of testing, so you do not have to. It’s easy to install, thanks to it's long power cord, and uncomplicated to use. The first thing you’ll notice about the Advanced Platinum is how dang bright it is! They claim it’s 2x-3x the intensity of any other LED lights, and I just might have to give it to them. The P600, which is equivalent to an 800W HPS, is outfitted with 200 3W chips—all made in the US. Its light wavelengths include 12 bands all the way from UV to IR, and its four high-speed fans are quiet. Like most of the best LED grow lights, it has switches to either run veg or bloom or both at the same time. It's by far the most expensive lights on our list. While the Advanced Platinum Series could very well be the highest quality light on the market, you can get similar quality for a fraction of the cost. I usually won't bring up the warranty, but these guys back their lights so much they offer a 5-year warranty with tech support seven days a week! Another large LED grow light with the easy, peasy switch from veg to bloom stage. Yahsence also makes growing cannabis a breeze, even for beginners with no harvests under their belt. As you practice your cultivation skills, you won’t need to figure out complicated light spectrum recipes; you just have to hit the switch. 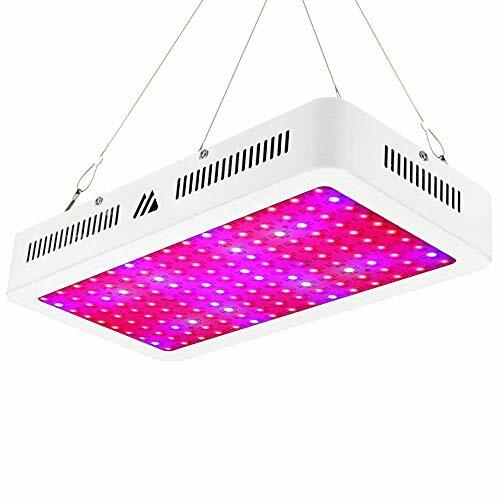 This high quality LED grow light is 1500 w of growing power, but still uses 80 percent less energy than a conventional high pressure sodium light. Yehsence has built an intense light, which should easily replace a 1500 w high pressure sodium grow light in your indoor growing operation. Still,1500 W is intense, which means they have had to account for slightly more heat than some of the smaller LED light systems. But, rest assured the fans and heatsink incorporated into every fixture will ensure the light cools itself without any trouble. With so much light, what’s the suggested space for this bad boy growing system? Yesence suggests a core coverage area of 5.4’ by 5.4,’ but it should work for a canopy up to 6.5’ to 6.5’ in size. 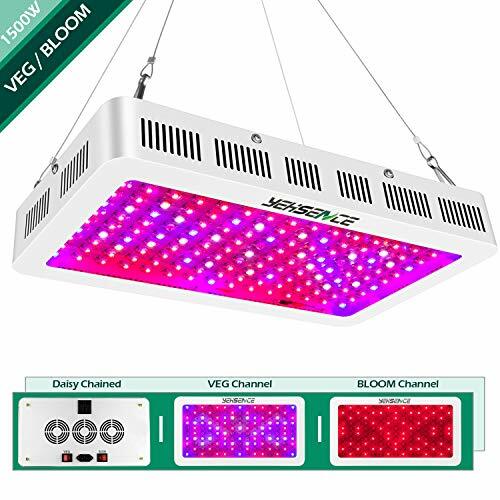 The folks behind the Yesence LED grow light suggest hanging it between 24” to 28” above the tops of your plants for best results. And the company stands by their product. They offer a 36-month warranty and total customer service to back up what they think are the best LED grow lights. What if you change your mind after using it? Well, return within 90 days under their money back guarantee. In this day and age, where online purchases can quickly go sideways, with no support once they’ve got your money, it’s really nice to see a company focused on supporting their customers. King Plus brings an interesting and unique approach to the efficiency of LED lights. Instead of housing a bunch of 3W or 5W chips, it uses 10W double chips that help not only save energy (think cheaper electricity bill) but also a longer lifespan. While it is a full-spectrum light, it doesn’t offer veg and bloom switch like we like to see in LED lights. What it also does better than most is keep cool. They use wider venting holes for more effective heat dissipation. This light is bright too! Puts out about 16,000 lumens so be sure not to look right at it! The light goes straight down, and so make sure your garden area is well reflected or keep your plants directly under the lamp. If you are rocking a smaller garden, the Galaxyhydro LED lights will grow your plants up to be healthy and your nugs to be dense. It pulls around 135W while being equivalent to a 250W HPS and a 400 MH. This model even comes with UV and IR lights that help both promote cell division (IR) and kill bacteria (UV). 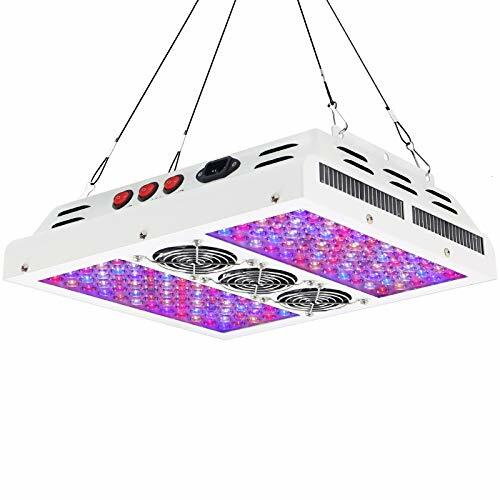 As of right now, they do not offer a version with more wattage, so if you need a light to cover more than a 3’x3’ grow room, then you’ll have to pick up a couple more supplemental lights. The quality of this light is exceptional, though. And it runs at the perfect spectrum for growing quality cannabis. It’s built with 100 3W Epileds chips which are quality chips and all together it produces around 7000 lumens. But remember, with LED lights lumens aren’t what’s important. It also has two built in fans that help keep your grow room cool, and they're quiet—so don’t worry about them running loud. I just wish that this lamp had an on and off button. 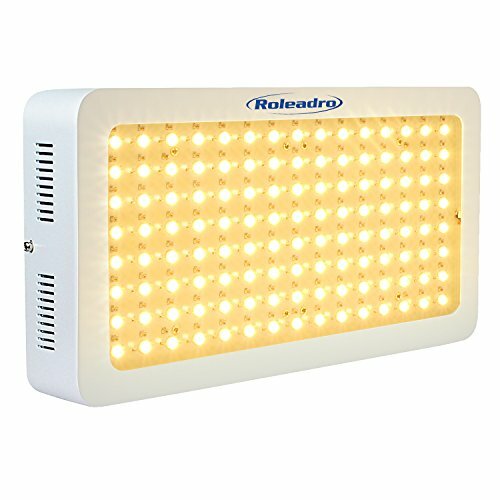 This is a 600 watt LED light by Roleadro, and it rounds out our top 5. It's full-spectrum hits all the high PAR wavelengths your plants need to grow big and fat. Plus, it has the added functionality of IR and UV. Comes with a daisy-chain to hang it up, and since LED lights don’t need a ballast, it’s plug and grow. It produces light by calling on the power of 120 5W Epiled chips creating a bright light that produces oodles of lumens. It has fans pretty much cover every bit of surface that doesn't house the lights, keeping it cool. My favorite part of this lamp is how easy it is to string a bunch of them together. Thanks to the double female outlets on each unit you can use multiple lights while only using one outlet. One thing I love about LED grow lights that have a white tint is it makes it easier to look for abnormalities on the leaves with the lights on. You will probably want to upgrade the hanging system, though. It’s set up to hang from one point making it hard to level multiple lights out, and I just personally prefer a four-point hanging system. Another awesome light from Viparspectra! They really are one of the best in the game when it comes to affordable grow lights. This light keeps up with a 600W HPS while only running at around 285W—It doesn't cut back on energy use as much as some of the other lights on this list. It’s full spectrum lights are enough to grow big buds in a 3x3 area, but you can stretch it to 4x4 if you need to—especially with a couple of supplemental fluorescents. What stands out about this grow light is the souped up fans. And I do mean souped up! Not only are they big and quiet, but the unique frontal fan design helps keep this light cooler than most. My favorite part though is the adjustable hanging kit, which allows you to adjust the height as your plants grow easily. Plus, it has three switches allow you turn on the white, red and blue lights separately. 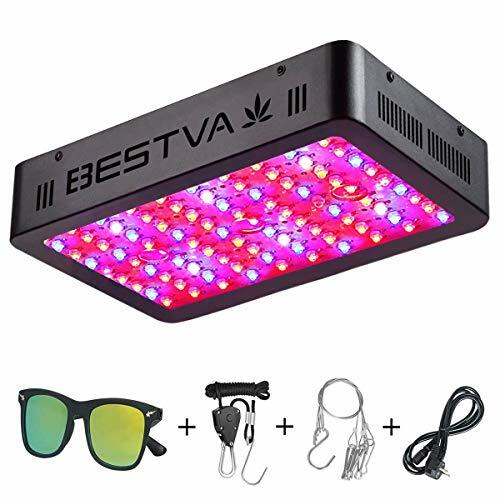 If you are a shoestring budget cannabis gardener, you can’t get much better than a Bestva light. Having one of the best watts per dollar ratios on our list, it’s a big favorite of the budget conscientious gardener. Built with 10W dual chips, these lights are super efficient and last quite a long time—100,000 hours. The “1000W” model draws 185 watts of power and replaces a 600 watt light, so I’m not sure why they call it their 1000W model. Regardless, we all know that with LED lights it’s the actual equivalent and the spectrum that matter. So how does the spectrum stack up? It comes in at 380-780 nm which is just inside PAR. The big issue I have with this light is that you need to shut it off for 30 minutes every eight hours. That is if you don’t want to worry about it overheating causing a shortened life span. While it’s not a big deal in flowering, in the veg stage, it can be a little tricky to manage, and most will probably opt to look past this manufacturers suggestion. 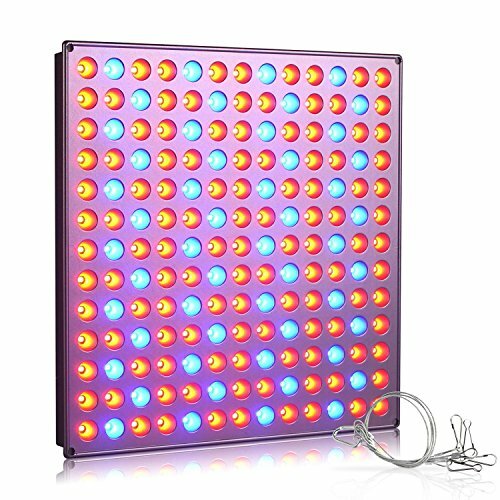 Maybe, you know you need an LED grow light somewhere in between a 600w and a 1500 w intensity and perfect for a small grow room. This 1000w fixture should do the trick. Every double-chip LED within this fixture has 5w power, better than many models out there with 3w or less. Still, even with the 5w individual diode capacity, this LED grow light pulls only 110w to 120w of power. For any old-school cultivators out there still using high pressure sodium systems, you’ll note how much power an LED system can immediately save you. Imagine 80 percent lower electricity bills! This system was designed building off eight years of research. Which means the full spectrum light it provides is refined, and perfected for the indoor growing environment. The engineers behind this product worked through the design kinks, to produce a top-notch indoor growing LED lighting system. And if you are worried about how much heat this system might release, due to its intensity, every fixture has two fans built into the design. The designers are so confident in the design; they also offer an impressive money back guarantee. 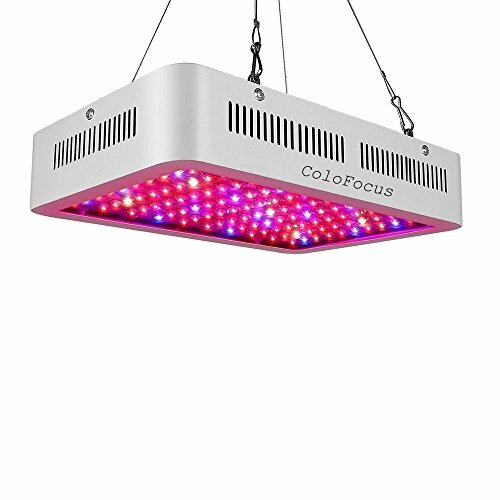 Available in three different sizes, this ColoFocus light is a great addition to any grow room. Another one that is rocking 10W double chips and UV plus IR lights. Its spectrum falls into PAR with 90% of the wavelengths being used by the plants. It has two independent fans helping to keep the system cool. There isn’t any way to alternate between veg and bloom lights which is a huge knock against this light. But, if you want a light that will create dense flowers, you’ll be thoroughly pleased. 5w per LED just isn’t enough for your grow area. You really want to hit it out of the park with this next harvest, and you want to invest in the best of the best. This Dimgogo 1500w LED grow system has 10w diodes! That's double or triple what others are selling. This model is a full spectrum one, which means it uses all the reds, blues, and ultraviolets your plants need to thrive in an indoor environment. The engineers worked hard to get this 1500w system to mimic the growing conditions from the sun, that your plant would get in an outdoor environment. The Dimgogo pulls just 268w of power but will cover up to a 6.4’ to 6’ canopy space. With three fans built into every system, there is no chance of overheating. Plus, each LED is wired individually so that if one happens to burn out, it won’t affect the remainder. If you’ve ever had any concerns about switching from an old-school, energy-hogging HPS system and the new wave LED options - it’s safe to go with a Dimgogo. Just like the other products highlighted here, the Dimgogo comes with an impressive warranty - three years! Plus, a 30-day money back guarantee. Morsen is a top quality brand that makes a pretty damn good light. Only available in high wattages (1500w-2400W), these lights are perfect for a closest, but they can also handle a larger grow tent. It has multiple fans that help to extend its life. 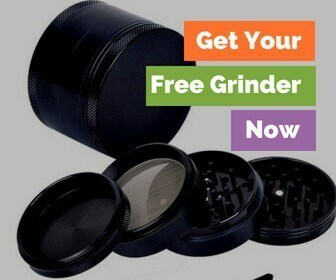 It uses 10W chips and can alternate spectrums depending on the stage of growth your cannabis is in. I will say, compared to other LED grow lights it runs a little hot, but still way less then the HPS counterpart. When growing seedlings, you do not need much light at all! In fact, too much can easily burn or wilt your tiny cannabis plants. What you need is the perfect spectrum and at a nominal amount. And you won't need to break the bank for your seedlings light either. That’s where this compact 45W Roleadro panel comes in. Putting out just enough light for a few trays of seedlings or even your clones, this is the perfect light to get your marijuana growing on the right root. You can just use CFLs for seedlings, but if you want to do it right, then do it right and grab the best LED grow lights for seedlings. If you’ve been growing marijuana for a long time, then you probably know all about HPS lights. After all, they were the hot new kid on the block at one point in time. Most growers that have been resistant to the change think their yields are good enough and that more expensive LED setup costs don’t outweigh the lower monthly electric bills. If that sounds like you, I’m glad to hear you’re at least now thinking about giving LEDs a shot. Dealing with temperatures that are too high is a big enough problem on its own (especially if you live closer to the equator). Your lights shouldn’t add to the fire. The temperature difference between LED lights and HPS lights is almost a biggest enough selling point on its own. The temperature difference between LED and HPS lights is almost a biggest enough selling point on its own. Plus, having cooler lights saves you money by not having to buy extra exhaust fans. Now, if you live in a cooler climate, you might think about staying with an HPS. They will help keep your grow room warm enough to grow cannabis, but this is rare. When it comes to light intensity they are both pretty damn similar. But, HPS definitely has the upper hand. Keep in mind , though, it is not lumens (light intensity) that cannabis plants need but rather the right wavelengths. What’s our goal when growing our own cannabis at home? So, how do HPS and LED lights compare when it comes to yields? On average, you’ll get around .5 grams per watt with an high pressure sodium. Full spectrum LED grow lights, however, give you anywhere from 1 gram to 1.5 grams per watt. If you can 3x your yields just by investing in the best LED grow lights, it seems like a pretty easy answer to me! This is another area where LED grow lights just absolutely crush it. With an HPS you can expect about 10,000 hours (sounds like a lot, right?). Well, with an LED 50,000 is the low end with some lasting all the way up to 100,000 hours! Because of the massive amounts of heat exuded by HPS lights, you don’t have as much freedom as to where you can place your lights. With LED lights, however, you can get them closer to your plants making it easier for them to absorb the light. LED lights let you custom tailor the wavelength color you are giving your plants, and most come preset for the perfect type of light your plants need during the vegetative and flowering cycles. HPS lights, on the other hand, emit the entire wavelength, so a lot of the light goes unused by your plants. We’ve already touched on quite a few benefits of using LED lights, and we’ll dive deep into a lot more later on. Most of us don’t have even a full room to devote to growing our marijuana. No, most of us are either closet growers or we're lucky enough to have an awesome grow tent or a grow cabinet. Smaller and easier to install: LED lights are plug and grow and use chips to convert energy into light. So, you don’t need extra equipment just to turn your lights on. Easier to plan ventilation with: You don’t have to worry about running extra ventilation just to remove the heat caused by your lights. Give you control over the spectrum: You control the wavelengths you provide your plants allowing you to give them exactly what they need during both stages of growth instead of the one size fits all mentality of HPS, MH or fluorescent lights. And that’s not even considering the energy savings! When it comes to outfitting your garden, there are so many options with every single thing you need to buy, and it is no different for grow lights. But there are a few specific things you should look for when making your decision. After all, the lights can end up being the most expensive part of your garden, and you don't want to make an investment that you end up regretting! The spectrum of your light needs to be at the front and center of your decision. Grow lights for cannabis need to include red and blue wavelengths and also ultraviolet and infrared. It is crucial the light be good for all stages of plant growth! Some aren’t, so you need to pay attention to the spectrum they say the light offers. For instance, if your light just runs heavy on red, it will waste a lot of energy of wavelengths that won't be absorbed by the plant during the vegetative stage. 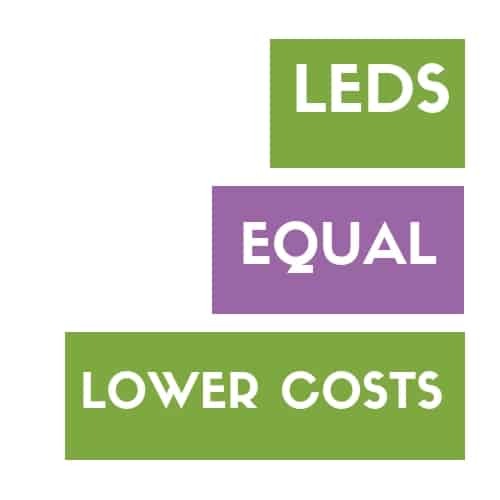 When it comes to LED lights, you want them to produce more light while using less electricity. Pay attention to the ratio of equivalent wattage and actual power drawn wattage. As mentioned earlier, one of the biggest advantages of a LED is the lifespan, right? If you have the option of one that will last 50,000 hours vs. 100,000 hours you need to consider if the extra cost up front is worth having a longer lasting light. Not only is heat dissipation good for your cannabis but it also adds to the lights durability. You want the light to offer some built in fans to help cool the lights down even more. Good LED lights have aluminum heat sinks built in to keep them cool. LED circuit drivers should constantly be supplying a direct current of energy and should regulate the intensity in response to any changes in temperature. To understand what a full-spectrum LED grow light is you need to know a little about the spectrum they are referring to. For starters, let’s talk about photosynthetically active radiation (PAR). Specifically, PAR is a spectral light range of 400-700 nanometers and is what most plants use during photosynthesis. You can use a PAR meter to measure the PAR output of your lights within the spectrum. All of the light wavelengths that plants love are found on this spectrum—blue, red, infrared and ultraviolet. So, to be honest, the term “full-spectrum” does not mean the light produces every wavelength imaginable, but rather that it produces the wavelengths of the PAR spectrum. You must also keep in mind that grow light companies do not have to get their lights tested and approved to be called full-spectrum, so you can only trust the term as far as you can trust the company behind the light. So, do you need a full-spectrum light? Your plants will benefit greatly from a light that produces all of the wavelengths of the PAR spectrum at a strong and continuous rate, so yes! That’s not to say plants don’t use wavelengths outside of the PAR spectrum. But they are either too intense or too weak to be of any use during photosynthesis. Also, photons in the PAR range contain the perfect amount of energy for the plant's electrons without causing damage. Cannabis thrives off three very distinct wavelengths of light. The deep red, blue, and ultraviolet spectrum. An expert cannabis cultivator knows that cannabis requires different types of light, during different times of its growth cycle. Blue light spectrum, between 400 nm to 500 nm, is especially crucial for cannabis during the vegetative stage. It teaches the cannabis where to grow, towards the blue wavelengths, and bush out with new leaves and shoots. As the marijuana matures, and starts the flowering stage, red and infrared (between 660 nm to 730 nm) is critical. It convinces the plant that the season is over, and it is time to flower. Changing from predominantly blue to red wavelengths mimics the light filtering through the atmosphere as the earth moves around the sun, and the seasons change. Clearly, if you are growing indoors, you'll want a light which can mimic the seasonal change, and encourage flowering. Some growers are now experimenting by adding a bit of green or UV light to boost certain features of the crop. These new experiments are a very interesting area of development for indoor growing. The science of light for cannabis is a fascinating place. We are almost through the very science-intensive portion of this guide! To absorb light, plants use pigments. The most abundant pigment they have is chlorophyll which they use to capture both blue and red light. Other pigments that absorb light are carotenes and xanthophylls that work to harvest various wavelengths before passing it over to photosynthesis. You should also know that plants absorb green light deeper into their tissue that any other color. That’s why green light can make photosynthesis more effective in a plant. This happens because the chloroplasts that contain chlorophyll end up becoming saturated. When the choloplasts become saturated, they allow green to pass deeper into the plant tissue. Once there, it is bounced around until it is absorbed by an unsaturated chloroplast or another pigment. Now I know that might have seemed a little heavy on the science, but it is important for you to understand every aspect of your grow room fully. And since the lights are just about the single most important factor, you should spend time studying them. How many watts you need per square foot with an LED. When it comes to LED lights, it’s not the watts are important. Using watts to determine how much lighting is sufficient for a given area is a legacy system built upon HPS lights. Still, it’s the most used terminology even with the rise of LEDs, so we’ll use it. 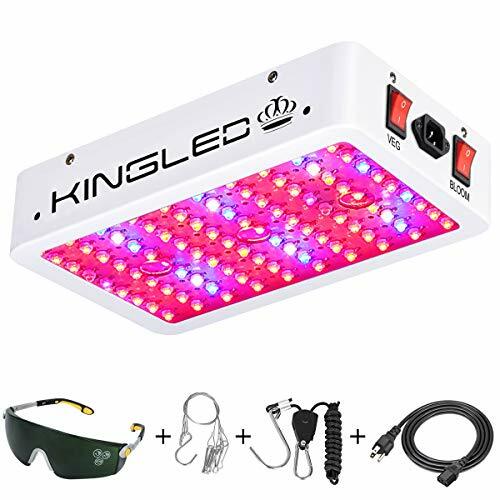 First, you need to know that when a LED light is advertised as a 300w LED grow light, it’s referring to its 300 watt HPS and metal halide equivalent and that it's only drawing in around 135 watts of power. The number you need to know if a light will work for your grow tent is the true power and not the equivalent. On average, with LED lights, you need 32 watts per square feet of actual draw power to grow cannabis. This is the wattage needed during flowering, while in the vegetative stage you might consider running around 50% of this. There is some subtle differences between growing with old school lights and LED lights. The low heat output might trick you into thinking you can put the light practically sitting on the plant and call it a day, but be warned. While there isn’t an exact science to it, LED grow lights need to be placed around 12-18” from the top of your plants. If you let the lights stay too close to the plants, not only will it stunt their growth, but LED lights can cause your cannabis leaves to become discolored and closely resemble a nutrient deficiency. Obviously, this can be a problem if you start messing with the nutrients when the problem is nowhere near the cannabis soil. If you spot discoloration, pay attention to see if it’s near the lights or not. If it is, you probably found your culprit and then move your lights back to prevent further light burn. LED lights that are too close can also bleach the top of your buds. This is especially common during flowering after the plants have been under the LED for months. You also need to keep an eye out for colas that are standing way above your other plants. If you do have one or two stray tall colas, you might consider tying them down to make them grow more horizontally, so they do not get too close to your light. For instance, if your light has 1W chips your plant will thrive at 12” away. While with a 3W chip or bigger the plant will do better at 18”+. You shouldn't be afraid to ask the light manufacturers the recommended distance from the light. It is not like you have to say your growing weed! Just say you’re growing high crop plants and they’ll be able to help you. This is a great question, especially considering many LED grow lights advertise their UV spectrum. Isn’t UV bad for you and your eyes? Plants and people are well suited to living under UVA and UVB light. Both UVA and UVB lights filter through the earth’s atmosphere and eventually make their way to the surface. While constant exposure to UVA and UVB light causes sunburns, and will eventually cause eye damage, it’s not instant. We use sunscreen and protective eyewear to avoid these issues. And under normal conditions, plants respond well to both these types of ultraviolet light. Cannabis in particular, actually loves a little UVB light, as it seems to promote THC development during the flowering stage. But what about UVC light? UVC is extremely dangerous for plants and people alike, but we are rarely if ever exposed to on earth. UVC light does not penetrate through the atmosphere in any dangerous levels, and LED grow lights do not use it. The only time you’ll see UVC light in the grow room is contained in a filtration system to kill pathogens. You will not see it out in the open, and if LED lights advertise it - you should steer clear! If you’re still with me, I know you’re serious about finding the perfect LED lights for your marijuana grow room. 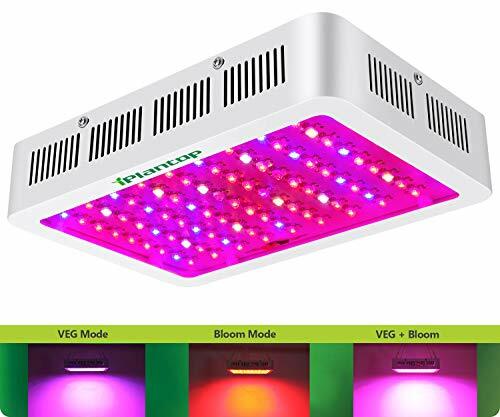 And, even though I am about to tell you which ten I think are the best available, you might want to know which manafacturers make the best LED grow lights, and then you decide on your own after more research. Plus, will all brands even work well for growing cannabis? That’s an excellent question! But, I don’t know. I do know this, though. Now, I’m sure you’ll notice that we do not review any Black Dog or Kind LED grow lights on our list of the best. And, it’s not like we do not review them because they aren’t great. It's just that at around $1500 for a light it just isn’t what a casual or beginner cannabis grower needs. When considering the LED grow lights that were going to make our list we factored in price, spectrum, wattage, heat and what other cannabis growers are saying about them. 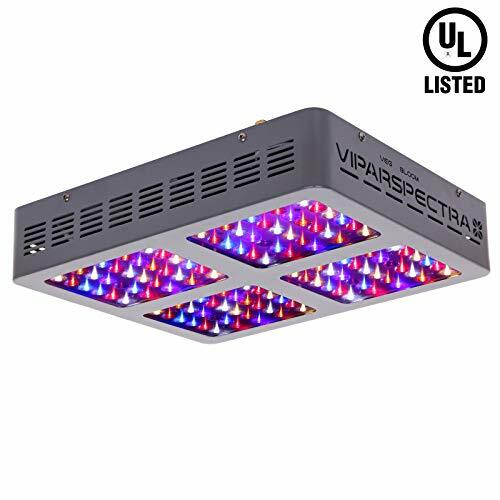 So, while we do recommend Black Dog and Kind lights, if you’re just growing for personal use, you can keep a ton of money in your pocket going with a brand like Vipar Spectra or Galaxy Hydro. 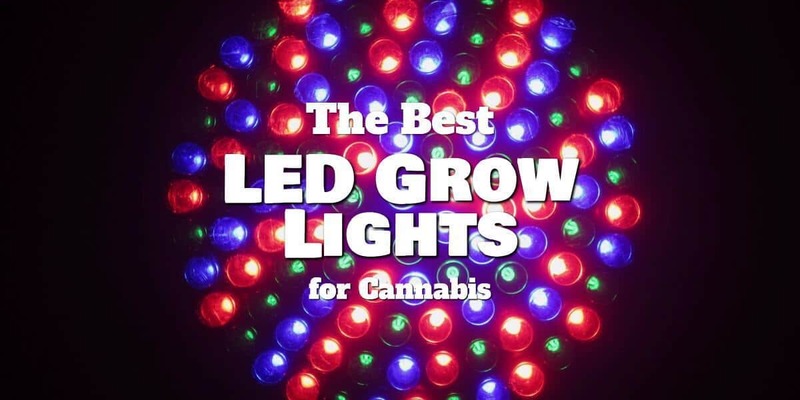 I hope you learned something in this huge guide and our reviews of the best LED grow lights for cannabis. If you have any other questions regarding full spectrum LED grow lights, please do not hesitate to ask. Did you end up getting any of the lights I recommended? THCoverdose.com is a participant in the Amazon Services LLC Associates Program, an affiliate advertising program designed to provide a means for sites to earn advertising fees by linking to amazon.com and any other website that may be affiliated with Amazon Service LLC Associates Program.